As we continue our series highlighting church building trends, it’s apparent that some of the trends we’ve seen are contradictory of other trends — design directions that actually go against ones we have talked about earlier in this series. While it may seem confusing to highlight church building trends that run counter to others, there’s a good reason for such a discussion—and it all comes back to your church’s particular vision for ministry, as you’ll see below. An earlier post in this series discussed the ongoing trend toward multi-use church design. Designing for flexibility is certainly a trend, but dedicated worship spaces are making a comeback—in specific instances. One driver of this trend is the book, Simple Church, published in 2011. It professes a focus on a few ministries that a church does well in lieu of multiple ministries for everyone and guides church leaders to consider a more basic perspective on church design. Dedicated church building spaces are most appropriate if your focus is on weekend worship and teaching only, cutting out extra activities and just focusing on doing weekend services well. The second counter trend is toward a more traditional church design. This is a trend we have only seen arise over the few years. 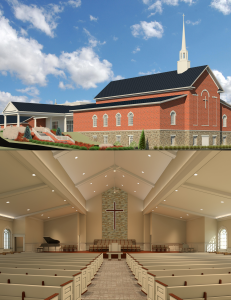 For some time, church building designs have moved away from the traditional feel, and there are certainly church leaders who continue to ask us to construct church buildings with a clean, modern look and functionality. However, there are two cases where your church vision might lead you to embrace a traditional church design. The first is if you are seeking to meet the expectations or desires of older communities. This target group includes older people who long for the “church of their youth.” They are drawn to church buildings that feel traditional and homey. The second reason is if your church vision involves reaching unchurched millennials. Many of these younger adults are seeking a sense of history and a connection with the past. They are even finding that liturgical programs can meet their need for history and connection. All of which means that if you are seeking to reach the oldest or youngest generations, a traditional church design might best meet your needs. How should churches embrace these contradictory trends? If your church is expanding and your church vision is to minister the needs of every generation, you can decide to follow both these counter trends—along with another trend we’ve mentioned—and begin a multi-venue ministry. On the one hand, construct or remodel a traditional church to attract the youngest and oldest generations in your community. On the other, host a modern worship service in a simple, contemporary church building that meets the needs of families. If there’s one thing we’ve learned in our 40-plus years of church design and construction, it’s that change is the only constant. We’re sure in the future, an entirely different group of trends will come along. Meanwhile, you can learn what else we’re tracking in church building and design by signing up for our free i3 webinar series. Just visit our home page, scroll to the bottom, and register for upcoming webinars that interest you.